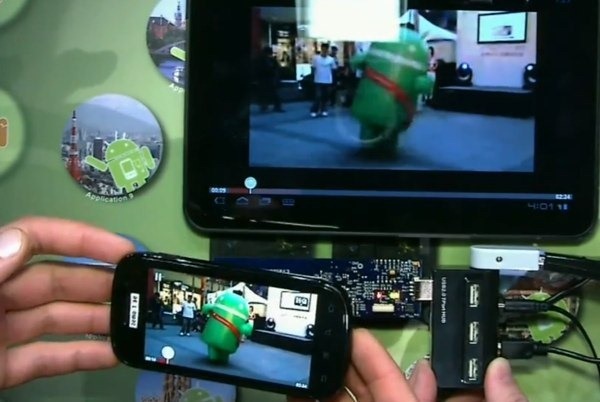 A lot of interesting products and services have been demoed at Google I/O 2011, including a number of interesting features for Ice Cream Sandwich, Android's forthcoming iteration. One of the less flashier features demoed is the 0-click peer-to-peer NFC sharing. This allows compatible Android devices to share content (contacts, links, YouTube videos) between the devices by simply placing them in close proximity to each other. No app needs to be run and no buttons need to be clicked - hence the "0-click" moniker. Sharing data between devices in this manner is not a completely novel concept as the cross-platform app Bump already provides similar features. However, Bump requires you to physically "bump" two devices together and, unlike 0-click NFC sharing, you must have the dedicated Bump app running on both devices. 0-click is much simpler in that you need only place the devices in close proximity and the data will seamlessly transfer between the two devices. Google intends to build 0-click into as many of their system apps as possible. They also intend to roll out an API to allow developers to enable 0-click in third-party apps. This looks like an incredibly useful feature as it ensures that you do not have to stop what you are doing to copy and paste content, it will be automatically shared. I can think of a number of situations where sharing content in this manner would be very useful, such as sharing contact information in a noisy environment or transitioning between your phone and tablet. Despite the services usefulness I can imagine that users would be concerned about its security. All a malicious individual has to do is place a 0-click compatible device near another such device and malware can be transferred or data can be downloaded. It will certainly come with robust security features - however, the apparent ease of transferring content is the main draw of 0-click, and if it requires passwords or other forms of authentication, it may lose its luster.